Sher Bagh Resort Ranthambhore, Rajasthan, India - a Forest Friendly Luxury Tented Camp in Ranthambore National Park - Rajasthan INDIA. India's original luxury tented camp Sher Bagh invites you to rejoice life on wildlife safari. Sher bagh is adjacent to the Ranthambore National park. Sher bagh family has played an active role in the conservation efforts since 1974 at Ranthambore. The camp of the She Bagh is well equipped in Edwardian, campaign genre furniture which famously adorned the future King Edward VIIIth’s celebrated tour of India’s wild heartlands in 1921. Arboreal lanterns are lit every night for adorn the pathway and campfire. Hotel Sher bagh provides world class service and known for its wildlife experience. The Library Bar is on the top floor of the main building is a retreat for guest after safari or a perfect place to relax in between game drives. Wireless features in the resort ensure your stay connected with your world. Hotel has shared pictures of the wildlife and Portraits of individual tigers with adorn the walls of the main lodge. 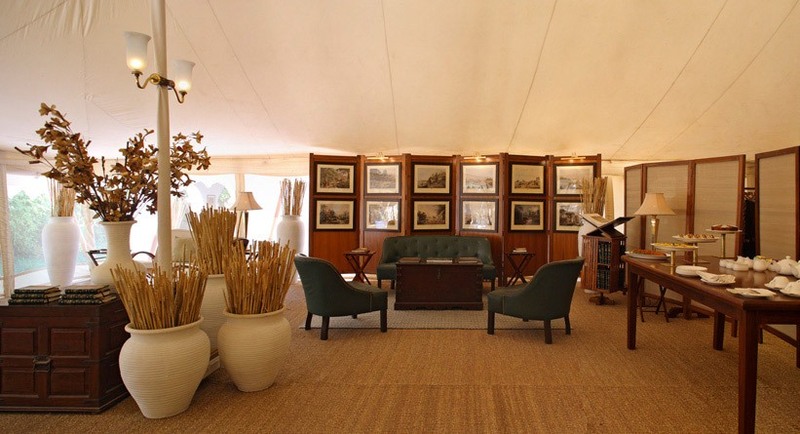 Sher Bagh offers 12 luxurious pioneering tented accommodations in verdancy of the Ranthambore Tiger Reserve. These twelve luxury hand- stitched canvas tents imitate the style of the 1920’s and to overcome fatigue after occurring safari. The showers and bathrooms have been described as “a hedonists delight” while others have called Sher Bagh “the most sonorous note in Ranthambhore‘s symphony”. Sher Bagh offers outdoor dining experience where guests are able to enjoy a traditional thaali’s meal with their wilderness experiences, the area surrounded by acres of weed and under a starlit sky dome. Hotel can make more private evening for those looking to spend more secluded areas of the camp for dinner. The food is cooked on clay oven and sumptuous combines of Indian traditional dinners and western lunches. All type of nourishing home-grown ingredients are hand- picked from the Organic Herb and Vegetable Garden. Sher Bagh invites guest to participate for live cooking. This is an enduring feature of camp which is one of the most relaxing ways to round off jungle safari. Above per night rates include Breakfast, Lunch, Dinner & all applicable government taxes.